When I left home, in 1969, with a five pound note, a bag of sandwiches and a change of underwear, to try my luck in the Big City, I ended up in a hotel in Bloomsbury – where the likes of Virginia Woolf and E.M. Forster had achieved greatness. Sadly, by the time I got there, Woolf was dead and Forster had retired to Warwickshire. But there I was, in a decrepit double-room on the top floor of the Goodwood Hotel, Rathbone Place, London W.
I say hotel – in those days it was more of a boarding house, run by an alcoholic ex-boxer called Jack. He had knocked two town houses together and nailed a sign that just said “Goodwood” (he enjoyed a flutter on the gee-gees) to one of the front doors. It must have cost him all of six shillings. After living there a year or so I had a conversation with Jack, where he said he had discovered the Secret Of Life. It involved a diet of gin – interspersed with tins of soup. We buried him a few weeks later. At this point, a relative came into the picture and announced that he was turning the place into a REAL hotel and we all had to get out – or begin paying hotel rates for our accommodation. But to be fair, he gave us several MONTHS to find alternative living quarters (the “season” was still a long way off). And so I moved to… well, actually this is now veering a long way from the TITLE of this piece. The fact is, the other day I decided to see what had become of the place in the intervening FORTY-TWO YEARS. It turned out to STILL be called the Goodwood Hotel – but now, it boasted colour TV and hot and cold running chambermaids. 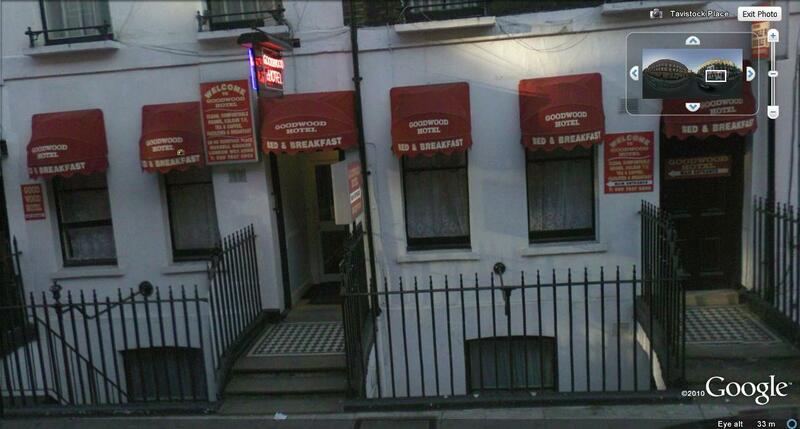 What I believe is termed a “boutique hotel” (sic). However, since I could not remember which street it was in – but knew my way there from Russell Square – I started my Google Earth search from that place. And the first thing I noticed was someone had parked an airliner in it. It took me all of one second to realize what had occurred. Geostationary satellites balance the Earth’s gravitational pull against the centrifugal force of orbit to stay at the same location, relative to the ground. But at that extreme distance – around twenty-five thousand miles – they are much too far away to get high-resolution photographs of our planet. Thus Low Earth Orbit satellites are used. Being less than a thousand miles up, these have to whiz around the Earth in order for the centrifugal force to balance the much GREATER gravitational pull of the planet. But they are still way higher than aircraft. Also, when planes are flying over London, they are usually on their final approach – or being stacked – therefore their height is much less than the seven miles up they normally travel at. And they have generally slowed to far less than their cruising speed of 550 mph. And so it was that while flying over Russell Square, a plane had just happened to be photographed by one of the satellites from which Google get their Google Earth pictures. Plus, the photo had been taken on high-speed film, making the aeroplane appear stationary. 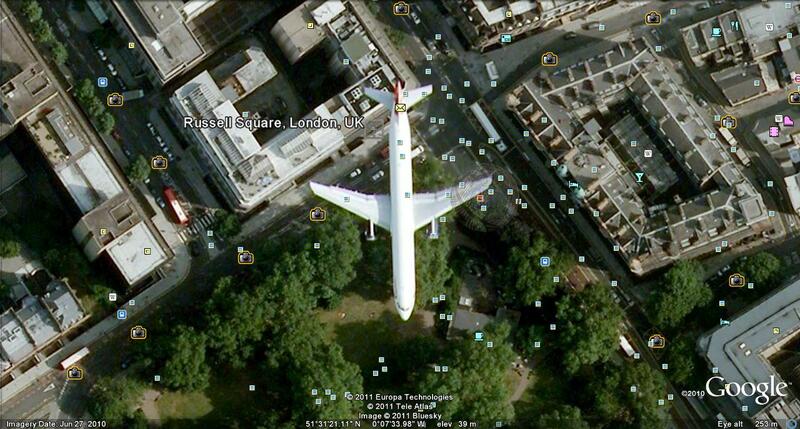 Nevertheless – it was still weird seeing an airliner apparently PARKED in Russell Square. Sensational! What a stroke of luck for you to come upon the particular Google Earth capture that had the jet in it! How marvellous to have the clear focus! (You explain why and how in your piece.) I am really envious! I have never come across any mention of this anywhere else. Congratulations! Yes – I looked this UP before writing the piece (Googled “airplane aeroplane airliner Russell Square”) and apparently, no-one else has spotted it! I s’pose there must be thousands of planes that have been “frozen” onto Google Earth – I just never SAW one before! I’d guess the odds are LONG – given the size of thousands of planes, versus the VAST size of Mother Earth. But it does look strange, don’t it?